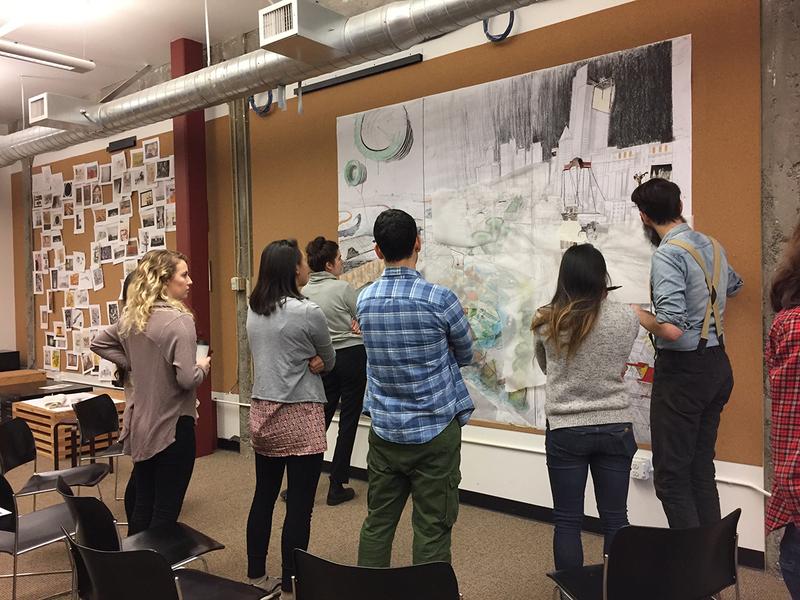 The Department of Landscape Architecture has joined forces with Seattle’s GGN firm to launch a series of weekend workshops, which focuses on representation in design. Drawing is a means of thinking and it is a language of dialogue. 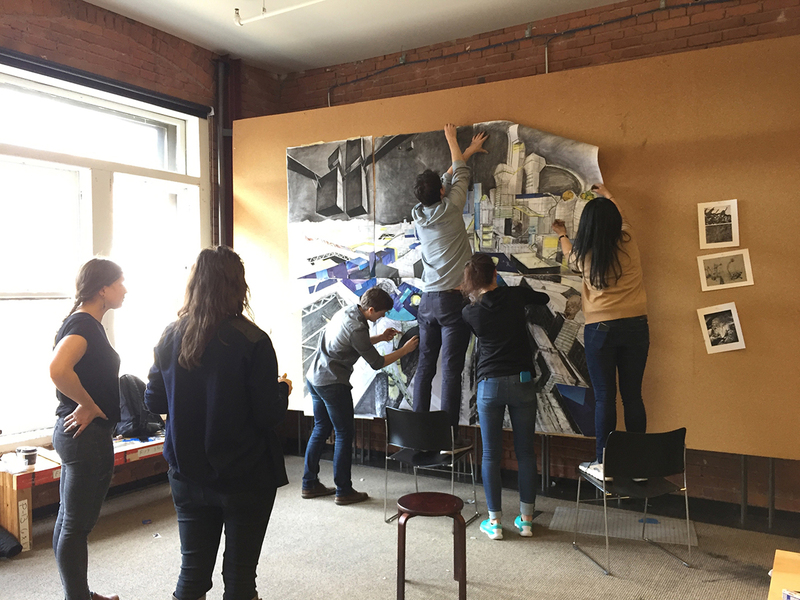 “Drawing is a language that expands and enhances our visions for the future of our landscapes and as such calls for a robust and rigorous investigation and exploration,” Professor of Landscape Architecture and project leader Thaisa Way said. Thus the workshops are posing and answering questions around how we draw, what we draw, and how we read drawings. Each of these experiences informs design as process and development and shapes how our communities understand and respond to design ideas and visions. 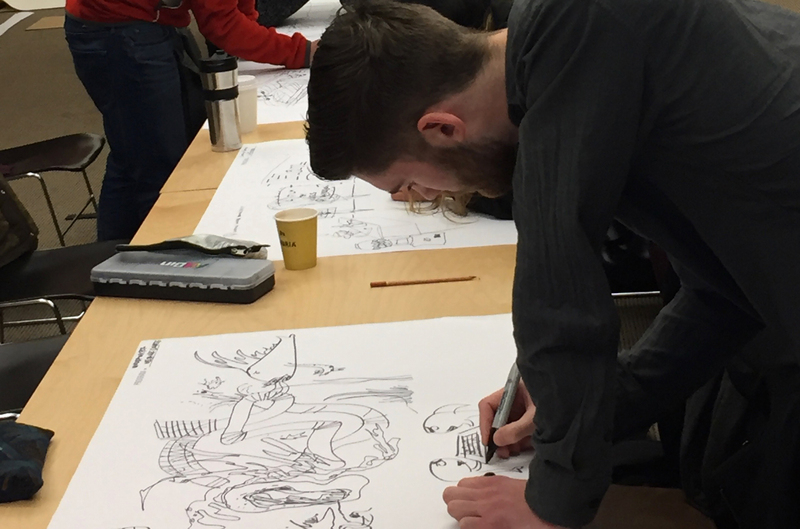 Michael Vergason’s workshop focused on drawing what the artist sees. Vergason shared with students his drawing history and journey to find inspiration. 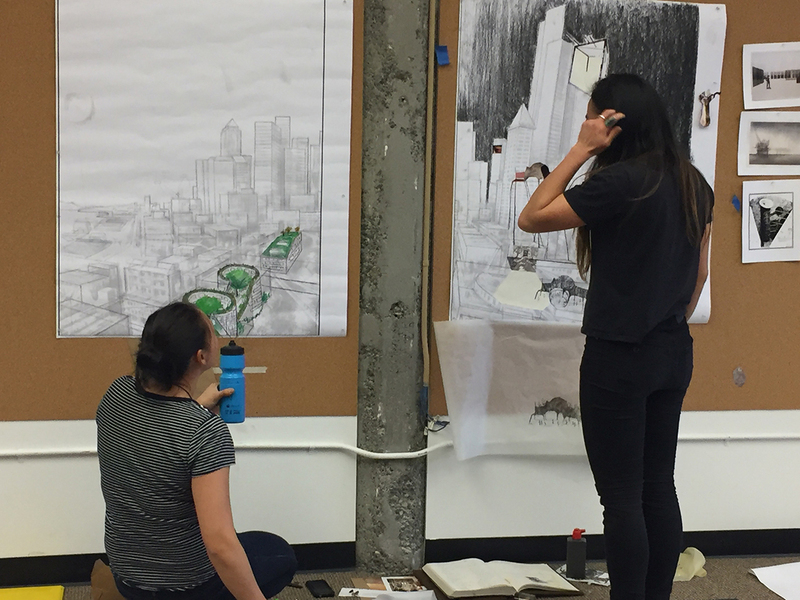 Landscape students spent the weekend using Japanese format notebooks with accordion pages, to draw trees, bridges, and courtyards. 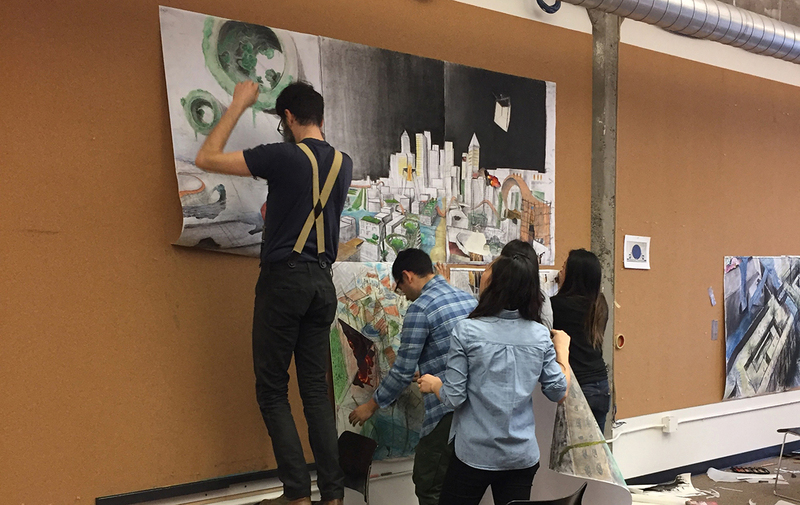 They explored historic sites through drawing through plans, sections, and perspectives. In early February the department hosted Alan Maskin ’88 and his associates from Olson Kundig. With Maskin, the students learned to draw what they imagine. 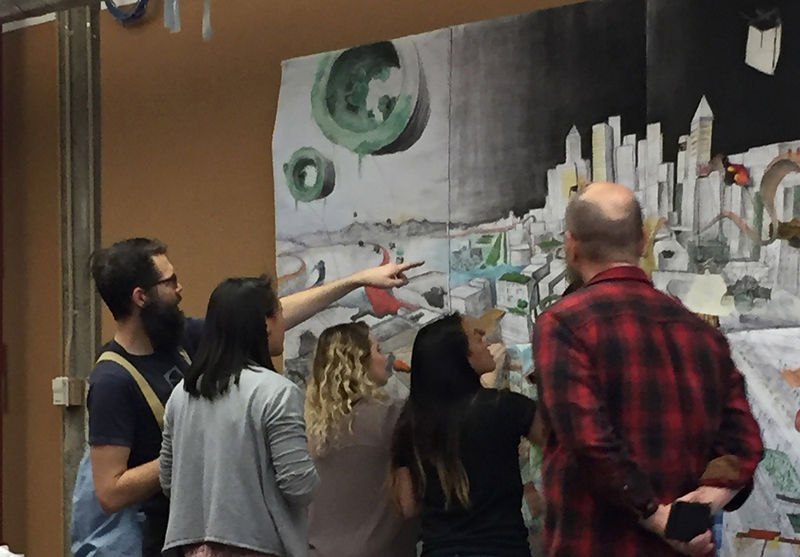 Students from landscape architecture, architecture, real estate, urban planning, and construction management heard about Maskin’s approaches to drawing and design. Maskin emphasized the influence and legacy of Emeritus Professor Frank Ching on his work. 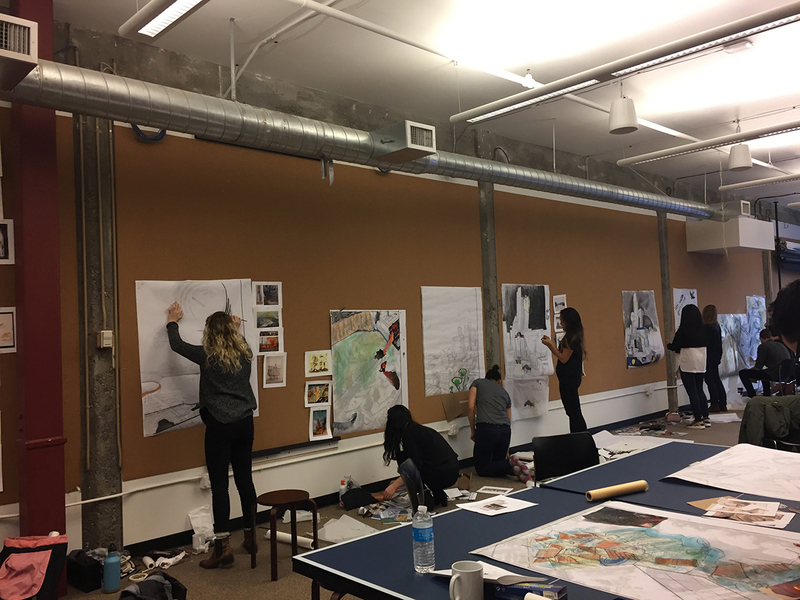 Students spent time on specific drawing exercises and gradually shifted to the grand landscape of the imagination including reimagining downtown Seattle. 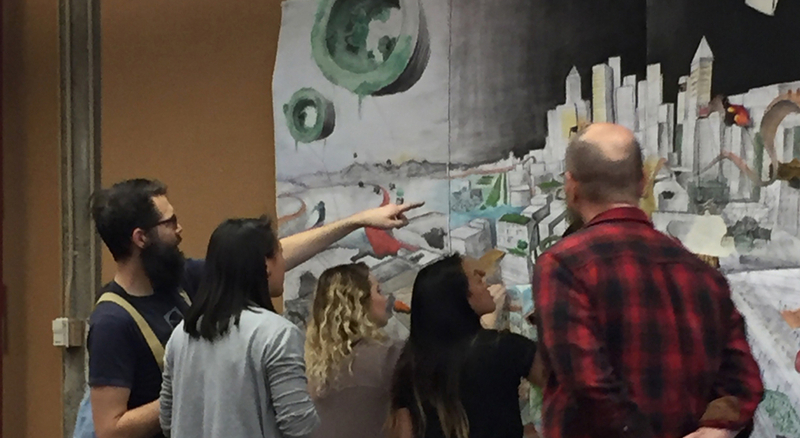 In teams, the students created three vibrant murals of a possible future for green and blue Seattle. Led by Teresa Gali Izard, ARQUITECTURA AGRONOMIA, a landscape architecture firm located in Barcelona and currently faculty at the University of Virginia. Applications will be available for students starting on March 31. Professor Thaisa Way is an urban landscape historian. She is the Executive Director of Urban@UW and recently published The Landscape Architecture of Richard Haag: From Modern Space to Urban Ecological Design.